1. Wash and clean the prawns. Marinate the prawns with other ingredients numbered 1 for at least 15 – 20 minutes. 2. Heat 1.5 tbsp oil in a meen chatti / claypot or a heavy-bottomed pan at medium heat. Splutter the mustards and fry dry red chilies and fenugreek seeds until reddish brown. Next add onion, little salt, ginger-garlic and curry leaves. Saute for a few minutes or until onion turns golden. Bring down the heat. Add the spice powders numbered 4 and saute until their raw smell is gone, about 1 – 2 minutes or so. Add finely chopped tomatoes, salt and saute until tomato turns mushy and oil separates, about 8 minutes. Next add 3/4 cup hot water, kudam puli pieces and enough salt. Bring to a boil at medium heat and cook for a few minutes. Add the prawns. Cook for 8 – 10 minutes or until done and gravy is thick. Add 1 tsp coconut oil and a few curry leaves. Set aside for 15 minutes. 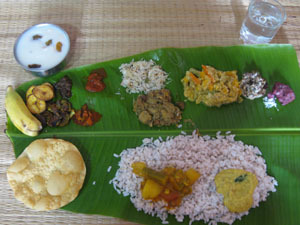 Serve with idli/dosa or rice and a thoran/mezhukkupuratti. wow this looks so tempting and delicious and beautiful clicks and presentation.. Incredible and terrific prawn curry,cant resist. Hi Maya, I tried out this prawn curry yesterday. Turned out well. But the colour wasn’t red as in ur pic, it was a dark brown. Did u use kashmiri chilly? Yeah, I used Kashmiri chilly powder for this recipe. Thanks for your feedbcak, Rusheeda..
looks very yummy and very beautiful clicks. Loved it. you tempted me again with another awesome recipe….going to make it real soon. I made this last weekend and it came out spicy and yummy… thanks for sharing your recipe. Thanks for your feedback, Sudee. Great to know that you liked this recipe! The prawns curry was tasty. The colour was a mix of red and maroon. Should not the kudam Puli soaked water be added instead of hot water and the soaked kudam pieces? Thanks for your feedback Seema. My kudam pulis are very sour, so whenever I add the kudam puli soaked water, the curry turns very tangy. You can add it if you wish. Made this today, was awesome. Thanks for sharing the recipe. I had used vaalan puli soaked water… and as u said it was a bit tangy… Will use kudam puli next time! Great recipe though! Keep it up Maya! Thanks Nikhil for sharing the feedback. Hope you will like the kudam puli version too.. I tried this chemeen curry today. It was fantastic! It reminded me of my grandmother back in Kerala. This recipe is a keeper! Cheers!